Bengaluru: They live in the far-off Australia, but their hearts always lie in their motherland. 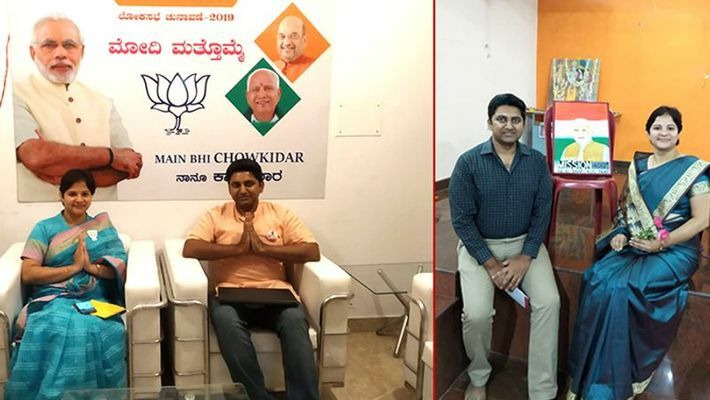 Naresh Bhardwaj and Srilatha Bhardwaj, a couple living in Sydney have made it a point to visit Bengaluru to be a part of the BJP campaigning process. They took leave for about a month and flew down to the city to immerse themselves in the party activities, with the sole aim of bringing Prime Minister Narendra Modi back to power. They are not hungry for name or fame or financial remunerations. All that they are driven by is the love for Modi. In fact, they spend money from their own pockets and meet lawyers, doctors, teachers and engineers to educate them about the policies PM Modi has given to India and impress upon them to vote for him, with an idea of a better and progressive India. The participation of such volunteers helps the party reach pockets which the regular cadres cannot. From the party’s national president Amit Shah to the rank and file, everyone welcomes such altruistic contribution, for it adds more teeth to the campaigning. Following in the footsteps of her husband is his wife Srilatha. They have taken to disseminating information about Modi’s schemes like a duck takes to water. She takes pride in the fact that it is Modi who has made their hearts swell with pride, re-establishing the missing connect. Whenever Modi takes a professional jaunt abroad, they say, he makes it a point to have chats with NRIs about their idea of developing India and their contributions for the same. It is their characteristic trait of his that has prodded them to contribute their mite for the prosperity of the nation, with Modi at the helm of affairs. Certainly it would not be an exaggeration to state that they hail Modi as the harbinger of a positive change in the society and vow to be by his side lock, stock and barrel in spite of Modi not being connected to them in a biological sense.